Memo to Gov. Schwarzenegger: you are right to make California a leader in the fight to control global warming. If a new study is right, your state is going to get hammered more than any other in the country as the climate changes. Droughts? Wildfires? Yes, yes and more yes. One reason climate change doesn’t get people as fired up as, say, $4 gasoline is that its worst impacts lie years in the future, and will hit different regions differently. Alaskan ports that used to be ice-locked for most of the year can now be used for more weeks before and after the summer’s temperature peak than was ever possible, for instance. It’s easy for people, who have ostrich-like tendencies anyway, to convince themselves that their region will make out just fine—maybe even enjoy milder winters. And they may be right. A new study, which will be published in the journal Geophysical Research Letters, projects how seriously global warming will affect different areas of the United States and Mexico. 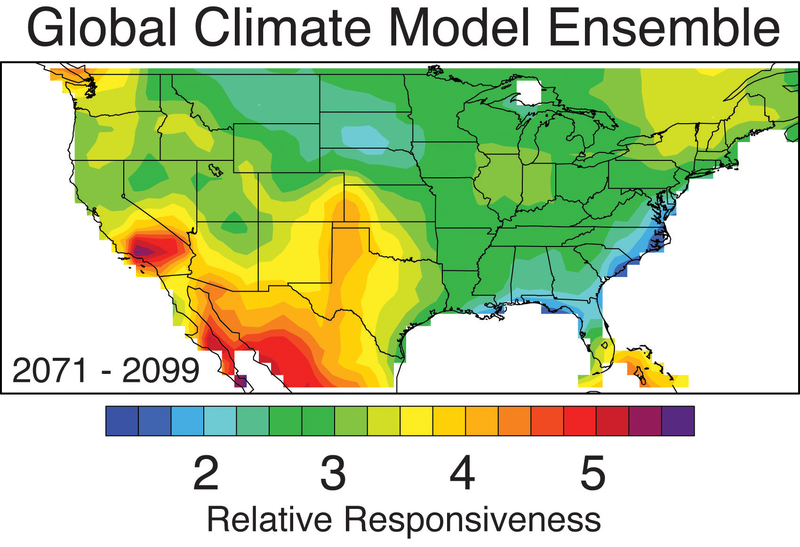 Look for yourself, but the bottom line is that southern California, northern Mexico and western Texas will be the climate-change hotspots in coming decades, the scientists, led by Purdue University’s Noah S. Diffenbaugh, conclude. And the regions most likely to get off easy? Florida’s panhandle and the Atlantic coast from Florida to Maryland. So people there can go right on denying the reality of anthropogenic climate change.